The fight for the leadership in the market of the modern alimentary distribution in Portugal, are running fairly high. The dispute carried out for the two Portuguese giants that is for the Continente and Pingo Doce, has known days of great imagination, animation and competition, in terms of promotional communication. While the Continente, (red) make a stand before the market with much confidence and security on “They will count on us to it, therefore our door is and always will be opened”, others as the Pingo Doce (green) is located for the “Portuguese for the Portuguese”. The new campaign of “grannies”, that recently it was launched by the Continente, stops beyond the message of “Count on us”, still intends the reinforcement of its positioning of market leader, through the image of the Champion of everyday low prices, with the message better “Prices even better, than they have been in the past”. And so, to ensure there is clarity about the message on its positioning, the Continente uses the speech in the first person of each one of “grannies”, to certify and to confirm that exactly with the current difficulties, and although the uncertainty of very complex a economic and financial panorama, old that is in a recent past, still was well worse. This is because, in its current youth, the grandmothers could not count on the Continente to have an easier life, either it be economically, or in freedom choice of services. By means of this very strong communicational strategy of the Continente, decides the Pingo Doce to answer with a promotional campaign having in consideration the difficult social situation that the country crosses, as well as the high tax of unemployment due to current economic contraction, appealing to the consumption what he is Portuguese, safeguards of the national economy, and the job. 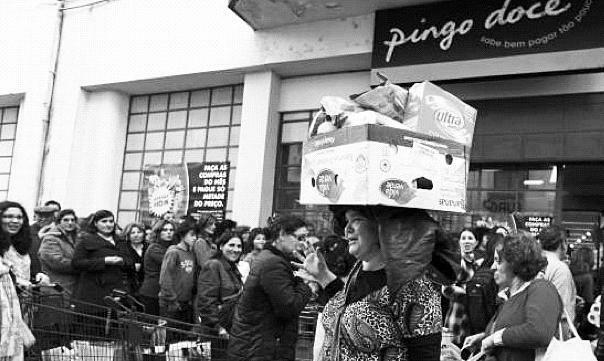 Thus, the Pingo Doce seats its promotional strategy, in two sources that is in the promotion of the Portuguese marks with strong discounting in price, to please to the Portuguese society, as well as in a clear closed marking to the image of champion of the low prices of the Continente. On the other hand, by making the discounting right-handers in price, it intends that the customer if does not forget its image of differentiation, and do remember their famous slogan launched in the recent past; “In the Pingo Doce, it is without cards and without complications”. With this communicational strategy, intends the Pingo Doce to mark its position of differentiation, and on the other hand, offer a pinprick in the promotional product beloved, of its direct competitor. Although the competitors are now pursuing their separate and different ways, both the giants of the Portuguese Distribution, intends to reach the same resulted final. This because using to advantage itself of the difficult economic situation for which it passes the Portuguese society, intends to emotionally reach the heart of the customers, so that these devote its current economic preference to them now, as well in the near future. However, this competition incited for the leadership of the market, with the constant one offers of promotions and discounting in selling prices, can both the companies place its economic survival at risk. This, since both run a serious risk to exceed one definitive break-even point of its images before the consumers, placing itself in a descending spiral of depreciation of its values associates, therefore is automatically to be the associates to an image of low prices, losing all its force as supplying of distinctive services.